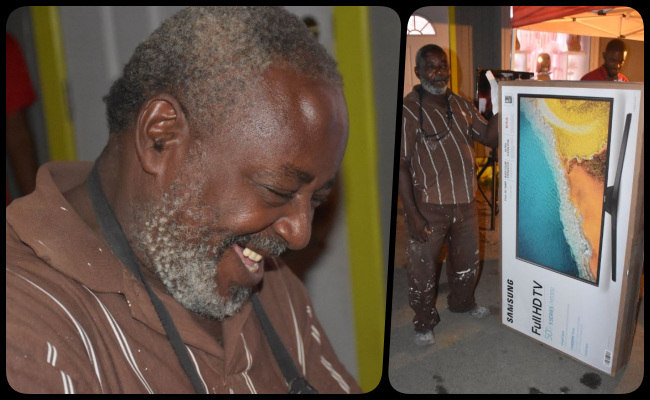 Jonathan Jones had only pulled-in at the Digicel tent in East End on Friday to purchase his usual call credit, but when he returned to his vehicle, he had a topped-up phone and 50-inch Samsung smart TV. He won the television set after automatically being entered into a Digicel raffle for persons who bought top-up credit at the location that evening. The 60-year-old said he was surprised as he was ecstatic. “My birthday was on the 4th of September so this is a nice gift,” said Jones as he stood beside the TV, which was almost as tall as he was. But, Jones was not the only resident to receive a Digicel giveaway that day. A number of other residents received brand-new cellular phones and internet boxes from the telecoms company. Digicel pitched a tent in the East End community on Friday as part of a territory-wide invasion that will be happening for the rest of the year. Internet users can expect faster internet speeds and cheaper prices, said Digicel CEO Kevin Gordon. But what can he watch on it? Stop being like that. He won the TV so he can watch or do as he please with the TV….he can even use it as a table if he chose. He can use it as a table unless digicel also give him a flow box to watch something??????????? ?